Previewed at: Randwick Ritz Cinema, Sydney, on 31 May 2017. ​There’s an arresting opening scene in Churchill as the protagonist reflects on the atrocities of war: while the British Prime Minister Winston Churchill (a fabulous performance by Brian Cox) is wading in the shallow waters lapping the south coast of Britain he hallucinates that the sea has turned red from the blood spilt by the troops under his control in WWI. And indeed, control is an underlying theme throughout Churchill. Working from a script by Alex von Tunzelmann, a British historian, Aussie director Jonathan Teplitzky’s flawed but emotionally revealing film is compelling viewing for the most part. Churchill is plagued by the ‘black dog’ of depression and tormented by a conscience consumed with the deaths of thousands of young men some 30 years before, men who were slaughtered on the beaches of Gallipoli. The film covers the days leading up to Operation Overlord, D-Day, and shows Churchill confronting his military allies as he makes a vain attempt to call the invasion off - the plan being to send allied troops across the Channel to Normandy in France and, thus, to begin to take back control of Nazi-occupied Europe. Both General Dwight Eisenhower (John Slattery) and Field Marshall Bernard ‘Monty’ Montgomery (Julian Wadham) have heated exchanges with the adamant British leader, who they feel has lost his potency in matters pertaining to battle, that he’s ‘yesterday’s man’. What’s the problem? Well, apart from fearing the massive loss of young men’s lives, Churchill doesn’t want to go down in history as orchestrating yet another failure. At the very least, if the invasion is to proceed, he wishes to lead his troops into battle… together with the King, no less! In a most telling scene between Churchill and King George VI (James Purefoy), the men discuss their legacy and their responsibilities as leaders of their country. 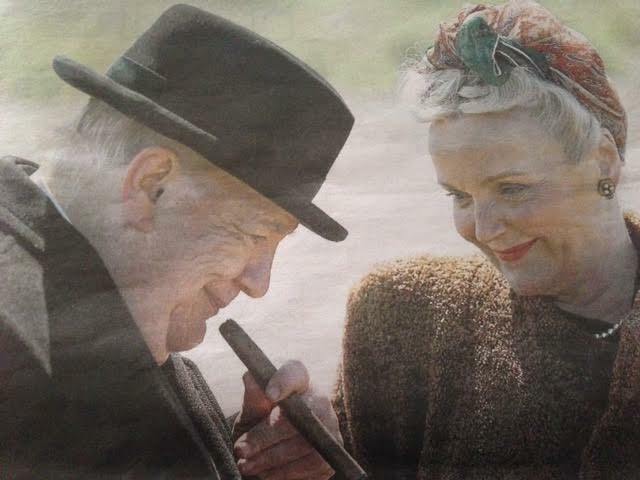 Miranda Richardson brilliantly plays Churchill’s long-suffering wife Clementine as a woman endeavouring to keep the lid on a volatile situation - and her husband’s drinking - while publically exuding grace and calm in the unenviable position of being the spouse of a man who’s clearly obsessed and not entirely sympathetic to the feelings of others, not least hers. Churchill is a film that is at times ponderous (many of Cox’s lines are delivered in a slow, declamatory fashion) but it includes a number of insightful scenes that continue to resonate long after you leave the cinema. Screenwriter von Tunzelmann has said, “I wanted to explore a part of Churchill’s life that touched on his depression and vulnerability because those are aspects with which many people can identify. It is a story that moved me: I hope it moves audiences too… There are some who will react against any depiction of Churchill’s depression because they think it undermines his status as a hero. To my mind, it does the opposite. The greatest thing we can do for our historical icons is remember they were human”. The film is a good lesson for younger generations - even if occasionally a bit fanciful - and it should succeed in bringing the terrible cost of war to a new audience. After The Railway Man and now Churchill, one wonders what facet of WWII Teplitzky will cover next?